The Primary 1 class continued to explore the interesting facts about South America. The students enjoyed a presentation about the country of Ecuador and the Galapagos Islands shared by Ms. Rose, a native of Ecuador. She brought a variety of cultural artifacts and shared traditions and heritage of the country. As they continued their study of the South American Continent, the Primary 1 students learned about the Chilean painter Francisco González Escobar and his unique technique. The students were able to choose one of his famous paintings and create their own version. The Primary 1 class enjoyed presentations about Chinese New Year. This celebration is the most important holiday in China and was traditionally a time to honor household and heavenly deities as well as ancestors. 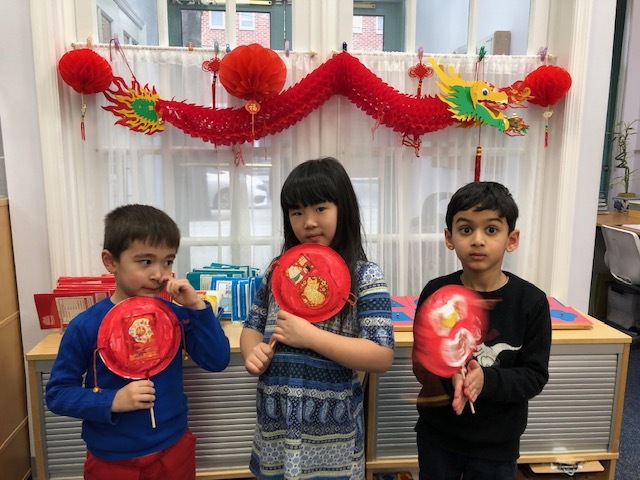 Each student was happy to receive their own red envelope and lantern and to create their own drum. In the Primary 1 class, the student work collaboratively in teams and also focus on independent tasks while working side by side.